We service all motorcycles no matter were purchased. Do you have troubles of repairing your motorcycle? We service all motorcycles if you have purchased at another shop or bought at private sale. Of course, motorcycles made by four Japanese domestic manufacturers are OK, and also many foreign manufacturers are fine. *However, if your motorcycle was made by very rare brand or manufactured a long time ago, it is difficult for us to get your motorcycle repair parts. In this case, your motorcycle repairing program may be limited. Besides, vehicles with trike or sidecar are not accepted. Please refer to the following for the wages of general repair. 〃 In case of there is a cowl or exhaust pipe desortion etc. Headlight bulb exchange Usually ￥1,100 In case of when exterior parts desorption is necessary, it depends on model. Battery excahnge If you buy a battery at our shop the exchange fee is free. Free If you bring a battery, the exchange wage is ￥1,100. We will dispos the old battery by free. We recommend a periodical checking for safe riding your motorcycle. ※Fats and oils will be separately charged. ※We treat Taiwanese brands same as Japanese domestic brands. A severe condition is one in which the usage situation applies to the following. Mileage for 6 months is over 3,000 km. D Riding with coolant temperature low. One time riding is below 8 km, and there are many riding with the low coolant temperature. ※1　At Severe and 12 months checking wheel bearings are checked with the wheels are attached. For 24 months checking takes off the wheels. ※2　Working time is a standard. There is a possibility that the required time may be changed depending on individual vehicle. Also, when ordering replacement parts it may take several days to arrive parts. In order to travel on a public road with a motorcycle, it is necessary to undergo a vehicle inspection every two years. Also, necessary the mandatory liability insurance which is cover the period of the vehicle inspection. Vehicle inspection continuation can be received from 1 month before expiration. If you receive it more than 1 month earlier, the current inspection period will be invalid. In addition, please be careful because it will be illegal to ride on motorcycles that have been expired vehicle inspection or mandatory liability insurance. When acquiring an automobile inspection, legal fees such as weight tax and inspection stamp will be charged. Please refer the following. 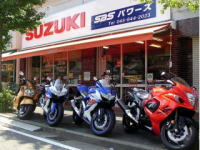 ※ The shop fee includes the price of grease, bike wash, document papers etc. ※ If evaluation by the exhaust gas tester is necessary, a fee of 5,400 yen (tax included) may be charged separately. ※ It may be necessary to replace expendable parts such as tires for passing the inspection line. ※ The weight tax is ￥4,600 for 13 years or more from the first registration and ￥5,000 for 18 years or more. When there is a change in registered contents, it is convenient to do at the same time as acquiring the vehicle inspection. Necessary documents are different depending on the changing contents. Please ask us in advance. ※ Tax payment notice will be mailed from the municipal office in which you live every May. The tax payment certificate for continued inspection is attached to that slip and its latest receipt is necessary for taking a new inspection. If you have replaced the muffler for anything other than genuine, the exhaust gas list is required. The newer models are regulated strictly exhaust gas. If you do not know whether the installed muffler passes the inspection, please consult us in advance. If you want to take a vehicle inspection while your bike is customized, you need to register "change of structure". Especially when the body size changes greatly, or changed lights such as head lights and turn signal lights attention is required. Usually one week, the shortest 3 days. If there is no maintenance or replacing by inspection only acquisition, the shortest 2 to 3 days. We respond as much as we can, but we may not be able to respond to the busy season.